Children's Stories - How Do We Get To The Other Side? "This banana is not ripe. I don’t like green bananas," Chipo said. She sat in the banana palm, her long tail wrapped around a branch. "Why do monkeys always eat bananas? Why can’t we eat coconuts, or papaya, or termites?" Chike wondered. "We’re monkeys; that’s what we do. We swing from trees and eat bananas," Chipo replied. She swung down to the ground and sat on the roots, looking across the river. "I wonder what’s on the other side of the river. It looks like there are a lot of banana trees over there. Maybe there are so ripe ones with yellow peel." "I’ve never been across the river," Chike answered. He swung down next to Chipo. "Let’s cross it and find out." "Chike, how do we get to the other side? The river is moving fast. We’ll drown." Tabansi came down to the river to get a drink. He spotted the two monkeys sitting at the bottom of a tree. "Hello," he shouted. "Why are you on that side of the river? There are a lot of banana trees on this side." "I knew it!" Chipo exclaimed. "That giraffe just said there were. How do we get to the other side?" she shouted. Just then a bright-colored toucan landed on a branch near Tabansi’s head. "Squawk! Why are you monkeys sitting over there when all the banana trees are over here?" Abiba asked. Zaid, the snake, slithered to the riverbank. "The bananas are yellow and ripe. Come across," he hissed. "How do we get across to the other side?" Chike yelled. "Swim across. The water’s not that swift," Abiba answered. "I’ve got a better idea. I’ll fly over there and you can hold onto my talons and then I’ll fly you back over." She flapped her wings and flew over to the other side. "Grab on tight, Chike," she said and took off. Chike was much heavier than she’d thought and felt herself going lower and lower. "Let go. I can’t carry you any more." They were right in the middle of the river, just a few feet above it. "If I let go, I’ll drown," Chike cried. "Let go or we’ll both drown," Abiba squawked. Chike let go and fell with a splash into the river. He started to swim and made it to the other side. He coughed and gasped for breath after swallowing a lot of river water. "I did it. I made it to the other side. Come on over Chipo. It’s not that bad!" he shouted. Chipo watched in horror as Chike fell into the river. She was relieved to see him pull himself onto the muddy bank on the other side. Tabansi, Abiba and Zaid called, "Come on Chipo. You can do it!" She stood on the tree root and dove into the water. She was very scared, but kept swimming as fast as she could. The water was cool and Chipo worried that there were crocodiles lurking about. "I’m getting tired," she called to the others. "There aren’t any crocs in this river, is there?" She swam faster just in case. When she felt she could go no further, she started to sink under the water. Tabansi lowered his long neck and grabbed Chipo by the tail. He lifted her into the air and dropped her in the grass near Chike. Both of the monkeys lay still for a few minutes, coughing all the water out of their lungs. A few minutes later Chipo sat up and said, "Now, where are those banana trees?" She was suddenly feeling very hungry. Tabansi started to laugh. "Is that all you monkeys think about?" Zaid hissed, "Follow me. I’ll show you." Abiba squawked and flew off to find some fruit and seeds. Chipo and Chike ran behind Zaid as he slithered into the bushes. "Here they are." 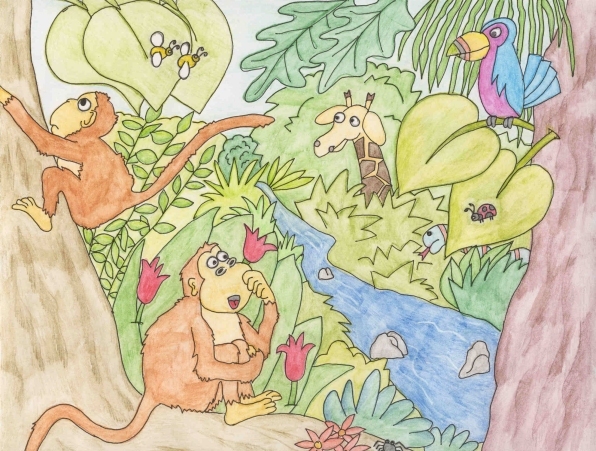 Chipo and Chike climbed the nearest banana palm and filled themselves on ripe fruit. When they were full and their tummies fat and stuffed with food, Chipo remembered something. "Chike, Mama said we weren’t allowed to cross the river. She’s going to be angry with us. We’d better get back." Chike grabbed an armful of bananas and the two ran down to the river. Their mama was standing on the other side calling to them. "Chike, Chipo, what are you doing over there. Come back to this side right now." "But Mama, how do we get to the other side?" Chike screamed. Tabansi was standing near a tree nibbling on its tender leaves. "Here we go again!"